Won't be there after all. Woke up feeling quite ill today. Since the Armstrongs have become difficult to find, I was looking more for data so I could get some aftermarket adjustable shocks and tune to similar to what the originals were. Tuning them buy feel is not a very good idea. So I tried all of the above techniques and still no luck. I tried using sockets in a press with no luck, even with lots of wd-40 and heat. I even tried burning out the bushings, but was just able to get the center sleeve out. So i tried using a hacksaw and cutting the outer sleeve to try and pry it out, but its still stuck. Not sure what to do. I might just have to give in and buy another link. Anyone have any advice on removing a difficult rear lower link bush (the old style)? I keep hearing people complain about the Spax shocks riding too high in the front. What is this all about, needing new springs to work with the Spax shocks? Whats everyones experience with Spax shocks, cause I am having this dilemma right now? Spax or Gaz. I had Spax shocks on the front before and they seemed alright, if not a little stiff. 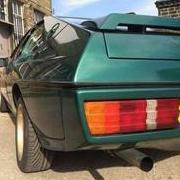 Does anyone know or have the original compression and rebound rate data for front and rear shocks for an S1/S2 esprit? I'm more interested in the USA specs, but any data is welcome as it will be a good starting point. Any ideas on how I can remove the rear hub nut with the hub off the car? I just did this a few weeks ago. Put the hub carrier in the vice so the vice actually holds the drive shaft to keep it from rotating. Then use an impact wrench to get the nut off. Easiest way to do it. Be careful trying to use a wrench. I tried it that way at first and actually broke my vice. The impact wrench is much better way to go. Good Luck! Sorry. I've been a bit busy, but i've added to the blog, including as many pictures as i thought useful.